Outdoor Courses for Scrambling, Climbing, Kayaking & Mountain Activities: Winter Skills Training Course Dates. Running from February to the end of April 2016. Winter Skills Training Course Dates. Running from February to the end of April 2016. Starting now, we are in readiness to run our Scottish Winter Skills Courses. The venues for these winter skills courses be Glen Coe, Aonach Mor, Fort William or The Northern Corries, Cairngorms National Park. The cost will be £150 per person for the two day course with up to six persons working with one instructor. If we don't achieve a minimum group size of four then the course will be cancelled - so do tell anyone you can think of who might be interested in joining!! Book by the end of January and get your two day course for only £120.00! April dates to be confirmed depending on conditions. Food & accommodation are not included on these courses but if you contact us to make a booking, we will put you in touch with a number of hotels, bunkhouses, hostels and B & B's in the area. 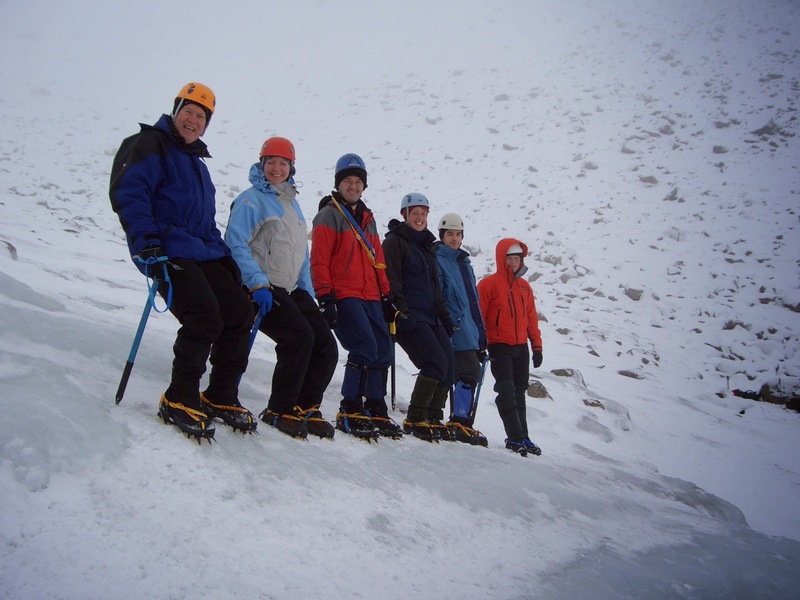 Why do a Winter Skills Training Course? The course is designed to help you become self sufficient in the winter mountain environment, be able to negotiate winter terrain and deal with snow & ice of different consistencies. You will learn how to stay safe and survive in these challenging conditions. On our 2 day Scottish Winter Skills Courses you can expect to cover a comprehensive syllabus including basic ropework and belay methods. One of the first things we'll show you is how to use your ice axe to prevent a slip turning into a slide. There are a number of ice axe braking scenarios to cover and the chap in photo three is about to arrest from a forward facing slide. Amongst other techniques, we will also show you how to provide security for your peers when you are out in the winter environment. There are many methods of making belays (anchors) by using the snow, a rope, your ice axe or even just yourself and a hole in the snow. We will look at basic snow & ice anchors, buried axe anchors and how to use Deadmen (a shaped aluminium plate specifically designed as a snow anchor). Other methods include the use of a body belay from a bucket seat and the use of equipment in other ways such as the Stomper Belay or the boot axe belay as shown here in photo four. Many winter skills courses do not cover the scenarios of belay construction and basic ropework - but we do, because we think you ought to know what to do when you might need to! Amongst other skills we'll cover snow-pack assessment and avalanche prediction. Avalanches are a real source of injury & death in the mountains in Winter so you will need to know what to look out for in the snow-pack as a result of wind action and recent snowfall. Reading forecasts from the Mountain Weather Information Service and the Scottish Avalanche Information Service are really good places to start as we will explain. As well as being able to interpret snow-pack and deal with security of steep ground, we will also show you what to do if you are caught out by bad weather, injury or benightment. 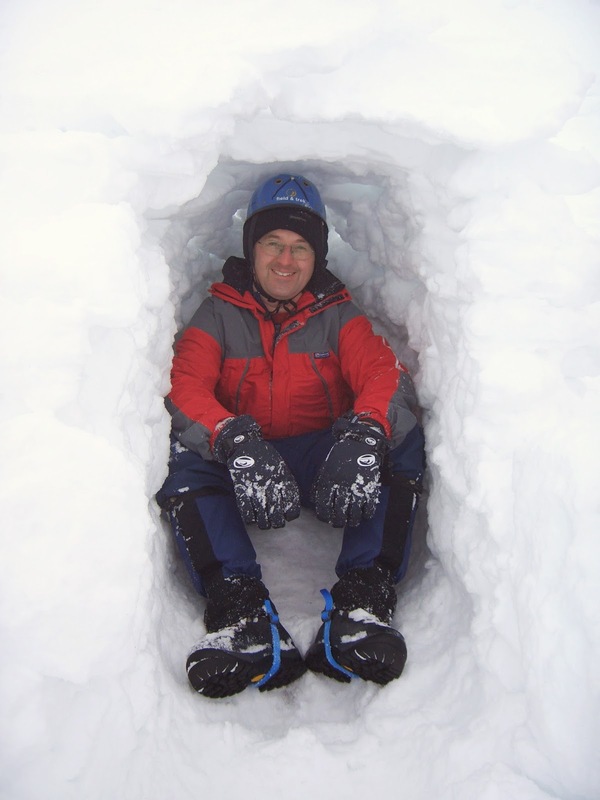 There are a number of options for building an improvised shelter - the easiest is to tunnel sideways into a bank of snow to build a snow-hole but you may have to build a shelter from blocks of snow or by other means. We'll show you what to do! Finally, you'll need to be able to use crampons to deal with hard snow (neve) and ice when kicking or cutting steps becomes too laborious a process. Crampons can be a life saver on one hand or a serious hazard on the other. We will teach you how to use crampons properly during you winter skills course using as many points as possible in contact with the ice to give you maximum security on icy terrain; and how to change the way in which you use them as the angle of the ice gets steeper. To book your place on one of our Winter Skills Training Courses contact us here, give Iain a call on 07761 483364 or join the facebook event page here.